Bed bugs likely received their name due to their association with people sleeping in beds. Bed bugs were introduced to North America by early colonists, but were documented more than 3,000 years ago in 1336 B.C. in Egypt. How much do you know about bed bugs? See below to take our Quiz. Once an infestation is established, bed bugs can easily spread throughout a building because of their ability to “hitchhike.” This characteristic makes it easy for them to be introduced into structures via used furniture or through the belongings of someone who had been living in or visiting an infested area. Bed bugs hide in mattresses, in bed frame cracks and crevices, and often on the backside of headboards, as well as near the bed. They prefer wood and fabrics over plastics and metal. 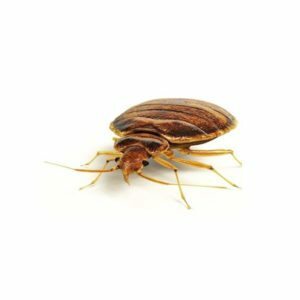 Bed bug infestations are not exclusive to hotels and motels – they have been found on or in boats, trains, airplanes, buses, movie theaters, residential buildings, libraries, restaurants and stores. They will hide anywhere humans regularly occupy each day, such as lobby or conference room furniture, train seats, and movie theater seats. Bed bugs carry germs and human pathogens; however, there is no conclusive scientific evidence that they can transmit diseases. Brown to reddish brown (after feeding). 3/16 of an inch (4-5 millimeters) long. Bed bug adults are broadly oval and flat, measuring 3/16 of an inch (4-5 millimeters) long; brown to reddish brown (after feeding). Bed bug eggs and young (smaller, unfed bed bugs) are white or light gray in color. Humans are preferred hosts, but they will feed on the blood of dogs and other mammals, as well as poultry and birds. They usually feed at night, mainly on exposed skin. Female bed bugs lay one to five eggs per day, and can lay more than 500 eggs in their lifetime. The white eggs are 1/32 of an inch (1 millimeter) long. There are five nymphal instars with a blood meal required for each molt. About 3-10 minutes are required for each blood meal. Developmental time (egg to adult) takes 21 days at 86°F/30°C to 120 days at 65°F/18°C, with an additional 3 or 8 days respectively for egg laying. Adults enter into semi-hibernation at temperatures below 61°F/16°C, and die if exposed to high temperatures for a few hours. Nymphs can survive without a blood meal for an average of 51 days at 81°F/27°C. Poorly fed bed bugs can greatly prolong their life. With normal feeding and reproductive cycles, bed bugs can live up to 10 months. Many insecticides are effective if bed bugs are sprayed directly. The challenge is that hidden bed bugs rarely come into contact with the insecticide. For more information on bed bugs, click here to download our bed bug information sheet.